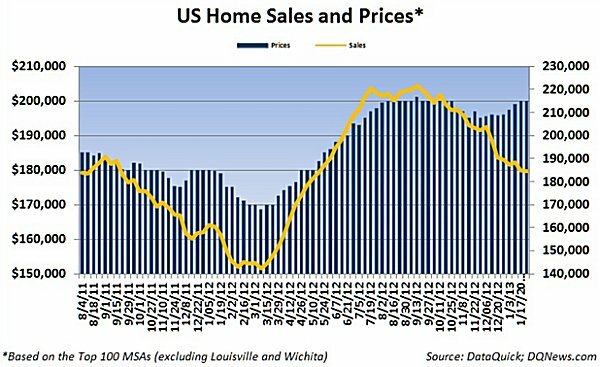 (January 28, 2013) The number of existing homes sold over the previous 30 days fell slightly last week while home prices fell a modest $100 from the previous week according to the weekly National Home Sales Snapshot released by DataQuick. There were 184,413 properties sold over the previous thirty-day rolling period ending January 24th, down 533 sales from the previous week’s total of 184,946 sold properties and 2.7 percent lower than the 189,466 properties sold four weeks ago. Sales volume was 16.8 percent lower than the current year’s cycle peak of 221,695 sales which occurred during the 30-day rolling period prior to September 13th. Last week’s home sales volume was still 9.2 percent higher than the 168,912 homes sold during the same period a year ago but was 1.8 percent lower than during the same period three years ago when 187,669 homes were sold. Home sales are about where they were in mid-May of last year. The median price of a home sold over the current thirty-day rolling period declined by $100 from the previous week to $199,900. Four weeks ago the median home price was $196,000. Home prices were 12.6 percent higher than the same period a year ago when the median price of a home was $177,600 and were 8.1 percent higher than what they were three years ago when the median price was $185,000. It was the 41st consecutive week that year-over-year home prices surpassed the previous year’s levels.